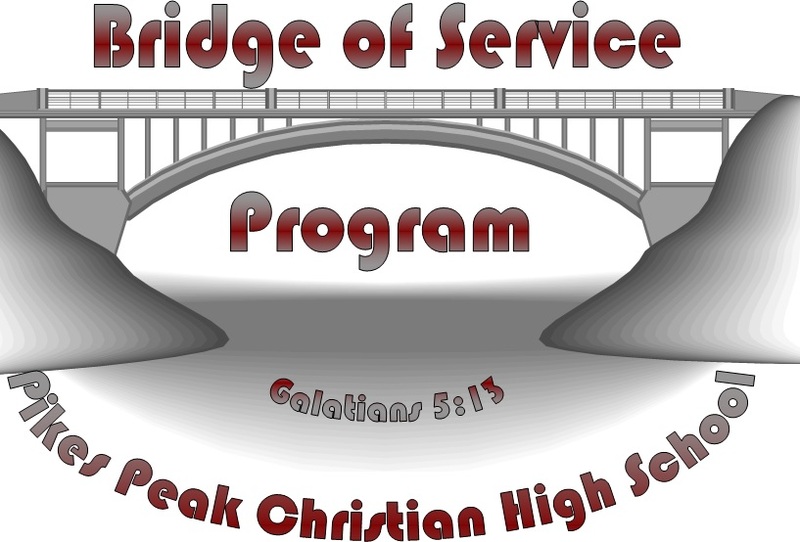 The purpose of the Pikes Peak Christian High School Bridge of Service Program is to encourage every high school student to begin or continue to foster an attitude of life-long involvement in their community through actions of love and kindness in the name of Jesus Christ. In response to the unmerited love and grace provided by God, it is our desire to see students build a bridge of relationship and love through action to others now and throughout their lives. Each school year, the amount of hours completed by a student will be recorded on their official transcript in percentage form. Completing the expected 12 hours will reflect 100% service credit completion. Up to 24 hours of service credit (200%) will be recorded per year on the official transcript. What does not qualify for service? What does qualify for service? Students must receive a minimum of seven (7) service hours in their community, as many hours out side of the school may be done by the student as desired. Many opportunities can be found through a local church youth group. As this program grows, PPCS will build a listing of community organizations that students can be involved in. Is the activity the student is going to engage in completely voluntary? Is it their choice to do it with no mandates or requirements to attend or act? If the student has the explicit freedom to not participate, then it is voluntary. If the student must attend, even if there is no grade, than it is not voluntary. Volunteerism is a key element of this program. Students can download the Service Verification Form (pdf file) or request a copy from the school office. The form must be completed to include signature of the supervising adult and the parent after the service work is completed. The student is to turn in the Service Verification Form into their Sponsor teacher when it is completed. It is recommended that forms are turned in as they are completed (not saved until the end of the year) and that families make personal copies for their own records to help track student service hours. The PPCS administration does reserve the right to determine what activities qualify for legitimate service before or after they are performed. This may include contacting the individual or organization served.